I’m late writing this blog again and am sat in my studio this Sunday with Sea Sick Steve blasting out! Suffice it to say ….I’m the only one here at the Courtyard so far today…. I might get some complaints otherwise. Oh well, sometimes its great having the music up loud and in a strange way it can be almost as relaxing as being out in a wild and quiet location. I think I’ve needed a bit of both of these to be honest, after what has been a very busy and quite stressful last week. It’s been a good one though and very enjoyable too …but I needed a break at the end. Our plan had been to get up at 5am and drive up to Glen Coe to walk Stob Dubh, one of the Munro summits of Buachaille Etive Beag. Trouble was that by the time we got to Thursday evening both Nita and I were completely shattered and even the thought of walking in what must be one of Scotland’s finest mountain ranges couldn’t cut through the weariness. 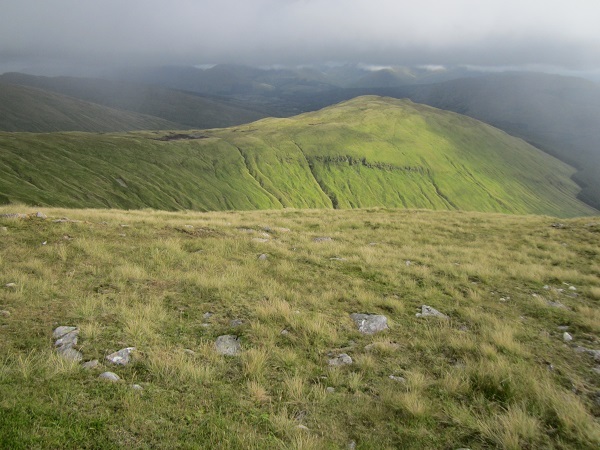 But we did need to get out and Nita suggested we head back to Beinn Odhar near Tyndrum. It’s a regular in our hill walking diary as it makes for a great half day but with plenty of steep and ‘up’ to give the legs a short but sharp work-out. It also had the advantage that we didn’t have to drag ourselves out of bed until 08.30! Have to admit we hadn’t checked the weather forecast for a couple of days but had seemed to remember that there was a nice splurge of high pressure lurking somewhere close to Scotland and so imagined we’d have fine weather. We did, but not in that clear blue skies kind of way we had expected. By the time we were driving along the shores of Loch Lomond it was dark and threatening rain and a good number of hills had cloud shrouding their tops. It was, however, a rapidly changing scene and in the hour it took to drive the remaining way to Tyndrum we’d had a bit of almost everything from bright sunshine to heavy bursts of rain. This was to be the story of the day. Part of the enjoyment of a half day in the hills is that you have time to stop for coffee and a snack before setting out and we did just this at the very popular watering hole that is The Green Welly. And then we were off, heading up the West Highland Way for a kilometre or so before turning off this popular track and making our way up the steep grassy slopes of Beinn Odhar. There is no messing with this hill. You gain height quickly and the views behind you are always impressive. 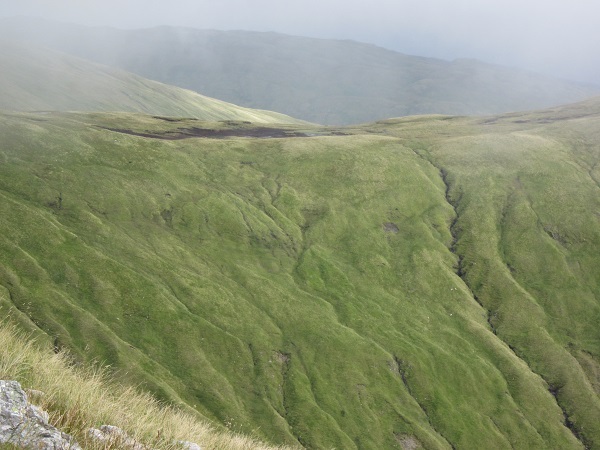 On Friday this meant a stream of fast moving dark clouds passing by at about 850m and the summits of the larger hills regularly disappearing and then re-emerging into bright patches of sunlight. For me, this was perfect and I felt a painting coming on almost as soon as we gained some height! 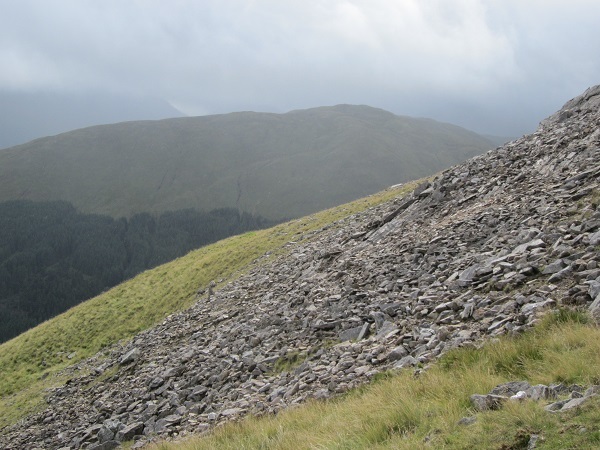 This is the hill that has old mine remains high up on the slope and it never fails to amaze me to think that people used to trudge all the way up there before starting a day’s work. As we picked our way through the rocky outcrops marking the mine workings the cloud descended and it was time to get the water and wind proof gear out ….suddenly it was cold with that very definite hint of winter being just around the corner. We reached the wee loch tucked under the final steep and boulder covered slopes leading to the summit and decided to sit and enjoy this incredibly peaceful spot. We’ve been here many times before and this really is one of my favourite places in the Southern Highlands. It is so unexpected and despite this being a Corbett it is a rarely visited spot. I guess we sat sheltering from the wind and occasional drizzle for about 50 minutes…..just watching the clouds come and go. This really was a perfect place to re-fuel.